The flexible video management solutions available today enable upgrade paths for your existing analogue systems. That means there is no need to throw away your analogue cameras! Video management solutions incorporate hardware and software to provide a platform to view multiple cameras live, interrogate and download footage, mass configure recording timetables and integrate with any central analytic functions. In the analogue days, analogue cameras were connected over an infrastructure of coaxial cables to a DVR, which functioned as the storage solution. The DVR came preconfigured with a basic software solution for managing the system, viewing video etc. This was achieved by connecting a screen, a mouse and/or a keyboard to the DVR. As the system was supplied together with the DVR, it was proprietary and offered limited functionality. In an IP (network video) system, the cameras are connected over a standard computer ethernet network such as LAN, WAN or the internet, very often utilising this infrastructure for power as well as data transmission. Video is either stored on a central computer server/PC, a network attached storage (NAS) unit, or on SD cards inside each camera. A web browser can be used to view live video from a camera, but for handling recording and other functionality in the system, in most solutions a video management software solution is needed. The video management software can be installed on the same PC as the storage or on a separate PC. In some systems, the cameras have enough video management software built into themselves so that the user only needs smartphone/tablet apps to view live and recorded video. Designed with openness in mind. This video management software allows you to easily integrate with other leading camera and hardware manufacturers. Wavestore is a developer of industry leading video management software (VMS) recognised worldwide for its simple installation and ease of use. 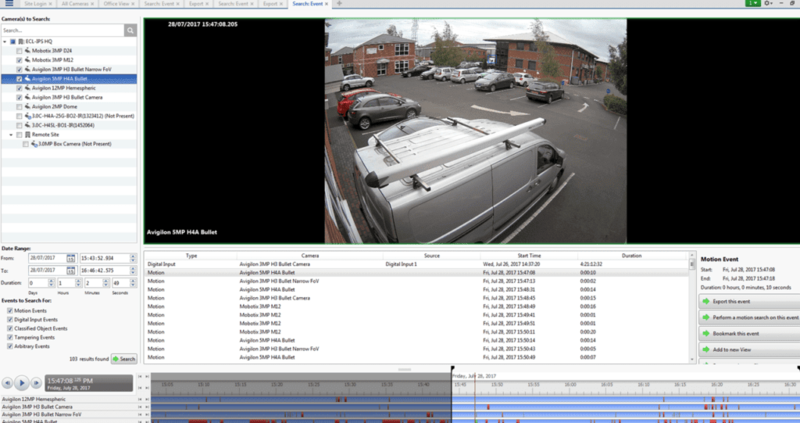 Connect any number of Mobotix cameras at any location into a straightforward and powerful video security system with centralised or local, user-based operation. Relying on video analytics to automatically monitor cameras and alert for events of interest is in many cases much more effective than reliance on a human operator, which is a costly resource with limited alertness and attention. So, what is Video Analytics? Video analytics (also referred to as Video Content Analysis (VCA)), is a generic term used to describe computerised processing and analysis of video streams. Computer analysis of video is currently implemented in various situations, however the term video analytics is typically associated with analysis of video streams captured by surveillance systems. Video analytics applications can perform a variety of tasks ranging from real-time analysis of video for immediate detection of events of interest, to analysis of pre-recorded video for the purpose of extracting events and data from the recorded video (also known as forensic analysis). Various research studies and real-life incidents indicate that an average human operator of a surveillance system tasked with observing video screens, cannot remain alert and attentive for more than 20 minutes. Moreover, the operator’s ability to monitor the video and effectively respond to events is significantly compromised as time goes by. Furthermore, there is often a need to go through recorded video and extract specific video segments containing an event of interest. This need is growing as the use of video surveillance becomes more widespread and the quantity of recorded video increases. In some cases, time is of the essence, and such review must be undertaken in an efficient and rapid manner. Analysing recorded video is a need that can rarely be answered effectively by human operators, due to the lengthy process of manually going through and observing the recorded video and the associated manpower cost for this task. Video analytics is an ideal solution that meets the needs of surveillance system operators, security officers and corporate managers, as they seek to make practical and effective use of their surveillance systems.